Students aged 12–14 years Young students are closely monitored, the programme foresees 1 supervisor every 10 students. Activities are related to students’ age, we provide comprehensive supervision and children cannot move unaccompanied. In addition to the weekly excursion we foresee 3 activities out of the village: a visit to a shopping centre, a funfair evening, and a walk along the promenade. Lights out no later than 10:30 p.m.
however they can move indipendently in the resort. We foresee a tutor/group leader for every 15 students. Activities are related to students’ age and according to their wishes and expectations. In addition to the weekly excursion we foresee further activities out of the village. On these occasions tutors allow students to walk autonomously in a certain area, fixing several appointments to control their movements. Lights out no later than 11:00 p.m.
Students aged 17-18 years Separated from the students of the younger age groups, senior students are hosted in a comfortable residence with full board. Students will enjoy more freedom, they are allowed to move independently in the resort and during the activities foreseen out of the camp. Linguaviva tutors will reside on site for support and assistance. The activities are conceived to meet the students’ wish to have fun, to move, to practise sports or express their own creative ideas. Lights out no later than 12:00 p.m. We foresee a tutor/group leader for every 15 students. Students can choose from a wide range of sports and creative activities according to their taste and interests. Every Sunday afternoon our Staff presents to the students the weekly programme of leisure activities, according to their age group. The instructors will encourage students to practise their Italian as they work with them to develop new skills in the afternoon activity sessions. Leisure activities, run and supervised by experienced activity leaders, are divided in: sport activities, creative activities and beach. Afternoon activities are divided into two time slots: from 3 pm until 4.30 pm and from 4.30 pm until 6 pm. Every day the students may choose to take part in a different activity for each time slot. During the activities students are always supervised by our Staff. 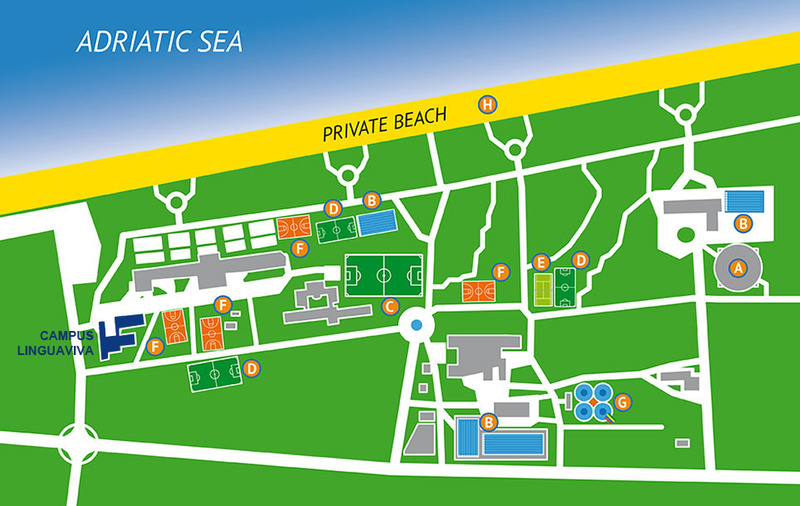 Sport activities: football, soccer, basket, volleyball, tennis, beach volley, beach soccer, waterpolo, swimming. Roller blade, in small groups skating along the paths of the camp or on the promenade. Aerobics and Acquagym in swimming pools. Upon request: it is possible to book horse-riding lessons at an extra cost. Beach: students who do not want to participate in any activity among the various offered, can relax on the beach, sunbathe and join the beach games. Evenings activities: outings in the city centre, sport matches (soccer, beach volley), open air films, discotheque, beach parties, special parties. Educational visits and excursions form an important part of the programme. Destinations are carefully chosen to be of great interest to the different age groups and to develop the students’ understanding of the country. On every occasion our younger students are accompanied by experienced members of the staff. The excursion program may be adjusted in the event of adverse weather conditions or if there are other special events of particular interest to the juniors. 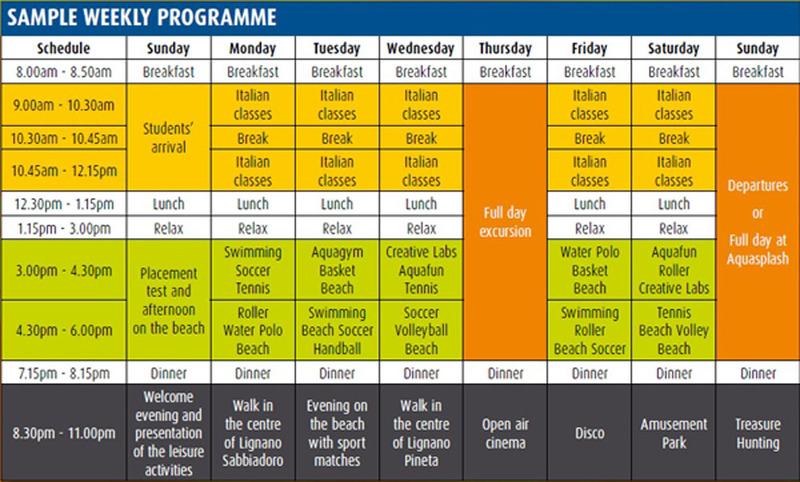 Our activity programme includes educational visits to interesting places near Lignano.